Open from April until October, the Hotel Village Eden is located in the splendid bay of Capo Vaticano (Grotticelle Beach), only 15 minutes from Tropea center. It is surrounded by nature and composed of residential Apartments and Hotel Rooms about 40 m far from the beach and Apartments on the hill about 250 m far from the sea (Dependance). Possibility of Panoramic Villas and Apartments at 50-150 m and at 1-2 km (Villini) far from the sea with air conditioning included, verandas sea view and all facilities offered by the village. Restaurant-pizzeria, bar, market, internet point, launderette 4 €, extra sun-umbrella 5 €, extra deck-chair 5 € and extra sun-bed 8 € per day, car and scooter rental, cycling-boats, boats, table-tennis, mini-cruise to Eolie Islands with departure from the hotel's beach and various excursions trip. Discover our non-refundable offers with a discount of up to 20% on the official rates. 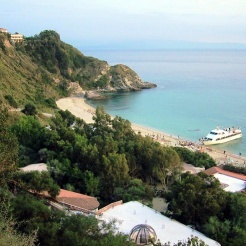 Grotticelle Beach, Capo Vaticano, Tropea, Pizzo Calabro, Scilla, Reggio Calabria, Bronzi di Riace, Mini-cruise Eolie Island.